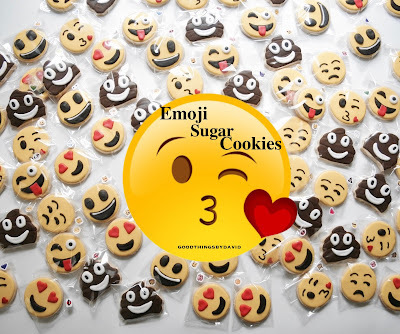 Emojis, those ubiquitous symbols that many of us use in our day to day messages to one another via phone, seem to be easily adaptable to cookie designs. My niece and nephew recently asked me to make them some emoji sugar cookies for a special celebration of theirs, and being the uncle that I am, how could I refuse their request? Through fits of the giggles and some laughs, they told me not to forget the brown "you know what" emojis. Yes, you know exactly what I'm referring to! OK, now I'm laughing as I write this, because you have to understand that I wasn't 100% sure I was even going to post these on the blog. 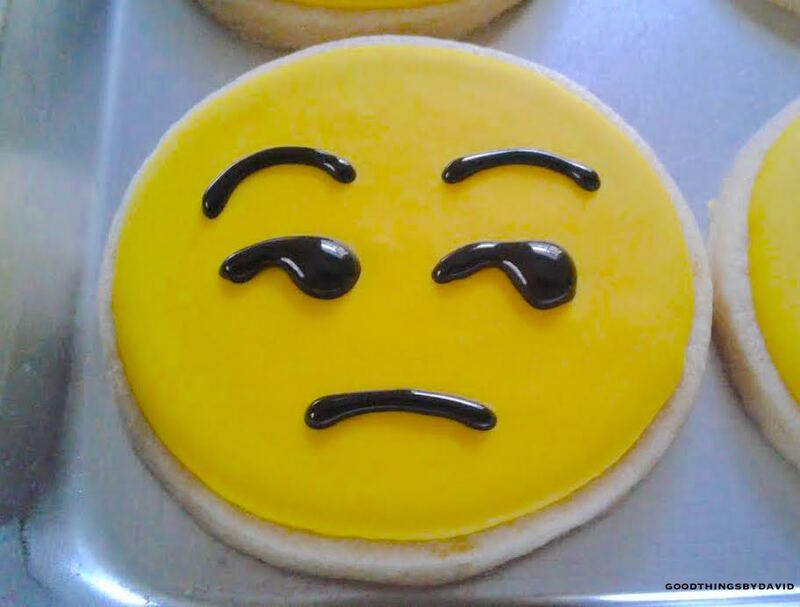 Emojis on Good Things by David? Well.....why not? Batch after batch of my sugar cookie dough and royal icing recipe were made a day before I began icing the cookies. 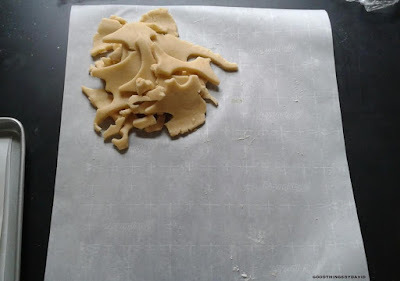 FYI: I love the new grid pattern on Reynold's parchment paper! It makes cutting so much easier. 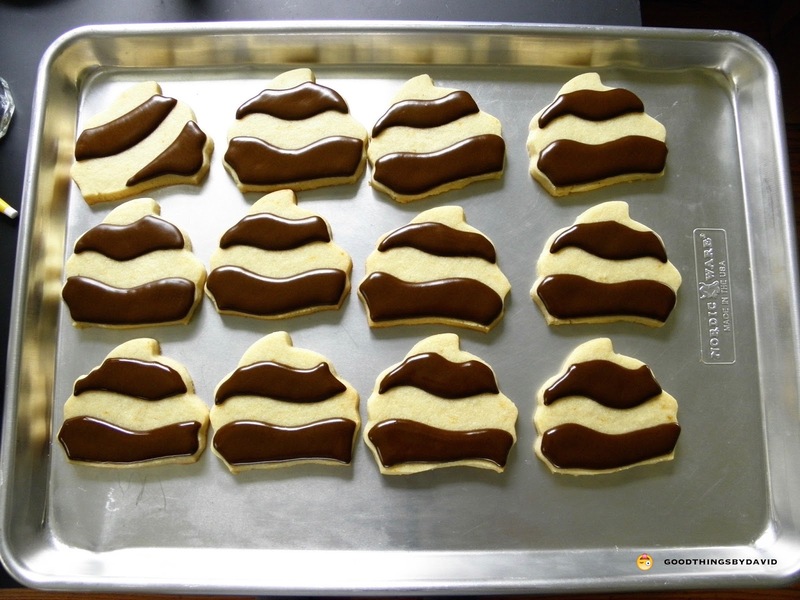 For the poop emojis, I used a Foose cupcake cookie cutter. 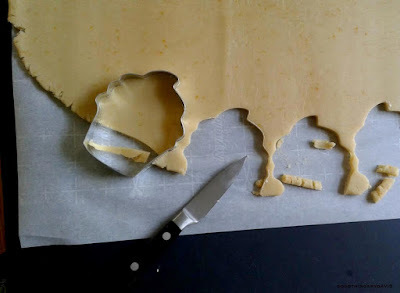 Working along the edges of my rolled cookie dough, I cut out only the icing tops of the cupcakes, and used a paring knife to give them a wavy shape at the base. Working in this manner, I didn't have to cut out the entire cupcake shape. Easy! 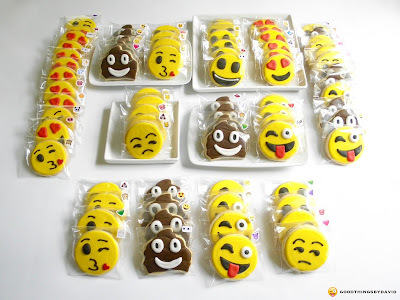 In order to make the layers of the poopies look like the emojis, brown royal icing was used in stages. I outlined and flooded alternating layers as shown using a #4 piping tip, letting them dry before the next icing. 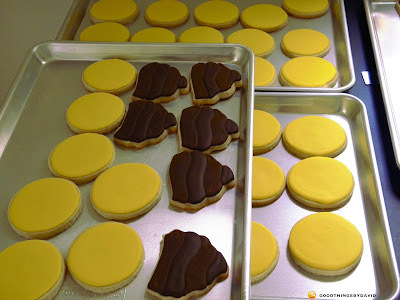 The rounds were outlined and flooded with a bright yellow royal icing and were left to dry before continuing. This icing goes very quickly if you use a large #5 piping tip. 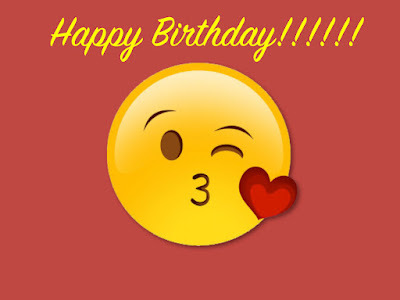 You can see the brown emojis with that layered effect. Heart shaped eyes were outlined and flooded in red using a #1 piping tip, and then a black mouth was added to the bottoms. Done! The kissy, winky-eyed emojis were piped with a #1 piping tip. 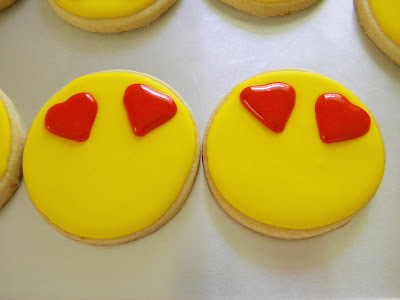 The heart-shaped candies were glued onto the cookies with a dot of royal icing. I loved these! This face made me think of a Hollywood Royalty actress from way back when. After I posted this photo on social media, I could not stop laughing at the responses from some of my friends. All of the emoji sugar cookies face accents were added on top of the dried bases. Whether I was piping large white eyes on the poopie cookies, or black mouths with red tongues on the other faces, it was easy to do this on the dried bases. I highly recommend using either a #1 or #2 (don't laugh!) piping tip for the eyes, mouths and other accents. 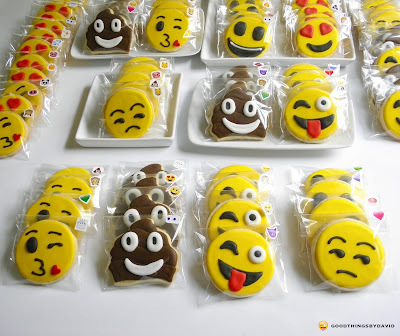 For this large batch of cookies, I decided to stick with less than ten emoji faces. 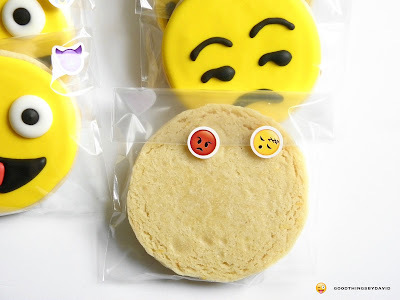 The cookies were meant to be party favors, so I placed each one in a cellophane bag of the appropriate size, and instead of tying them with ribbons, I sealed them with emoji stickers. You can see how each of these cellophane bags were sealed shut. Sheets of emoji stickers can be found at many party supply stores or discount stores. Don't forget to add one or two to the the fronts of the bags as well. 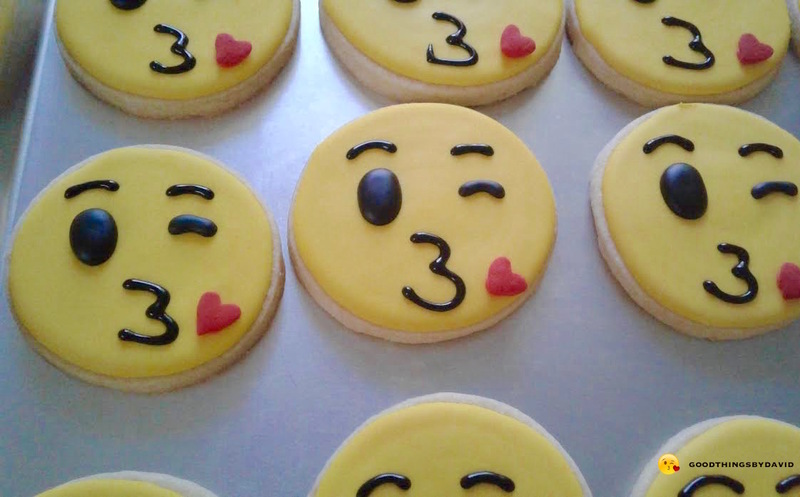 Happy face, kissy face, heart-eye face, tongue-out face, annoyed face and even poopie face emoji cookies are easy to make, because the dozens you see here don't require that many shades of royal icing. Plan ahead and give yourself a day or two to make them. I think the most important thing is to let the bases dry completely before adding the rest of the accents. This way you avoid color bleeding on the yellow faces. If you plan on making these for a kid's birthday party or to hand them out to coworkers, friends, etc., don't forget to make the poop emojis. Even they are cute and guaranteed to produce a giggle. A very sweet Happy Birthday to my little ones!! Uncle loves you very much! Beyond words! Great job my friend!